Treat your finances like you own a company and you are the CEO. Budget negotiations should be part of everyone’s financial plan not just the government and business owners. You may be working for someone else making them rich but when it comes to your money there are ways to achieve the same successes but on a personal level. It’s amazing how many people take their budget for granted and accept the bills they are given instead of putting the green light on budget negotiations. You’ve worked hard for your money now make your money work for you. Don’t let your cash float away without seeing how much you can save. You don’t have to be an outspoken customer to get a better deal. Before you attack (take that with a grain of salt) you must be armed with details and the outcome you’d like from your budget negotiations. If you need to balance your budget but you’re off by $50 try to see if you can get your bundled-telecommunications services lowered. Make a deal. The top way to trim budget expenses is by negotiating the interest rates on your credit card if you have debt to pay off. I’m not a fan of holding a balance on a credit card but for some people this is what they’ve used because times are tough. If you’ve done this don’t be afraid to pick up the phone and make a phone call to customer service and ask them if they could reduce your interest rate. Anything is better than paying out more money than you need to. Since the new year has begun we’ve sorted through our monthly budget making changes as they come in because like any type of financial transactions you can’t just set it and forget the way you spend and save. Below I’m going to share with you the way we saved some cash this year and how you can go about starting your own budget negotiations. Just weeks ago we had to contact the Rogers customer retention department to either end or renew our services with them. The wife and I talked about getting rid of our home phone as we don’t use it often. If we couldn’t score a comparable deal with Rogers we were going to sink that expense fast. Currently we have 1 cell phone, Digital Cable, High-Speed Internet and a Home Phone. Our total bill used to be $162.72 for the past 2 years. It was time for us to make the phone call to the customer retention department to start the budget negotiations. I was fortunate to score a great deal this year for our family through simple budget negotiations. The exact bill will be around $160 each month which is a few dollars cheaper than our current bill. Awesome for us even if it is only a few bucks a month. If we knocked the home phone on the head we wouldn’t have been any further ahead so it looks like we have it for another year. The only downside is the time you have to spend making that phone-call but in the end it’s worth it especially if you can get a two-year plan at rock bottom prices at a large company like Rogers. This past month I had a BIG problem with the bathroom I was renovating upstairs. While turning off the water I had a major water leak which resulted in us having to call a professional in, the brother-in-law. The water leaked through the ceiling, into the kitchen and created a nice mess. Thank-fully all the ceilings are coming down in the kitchen when we do renovations but it was still a job for the pros. The repair that I needed done likely would have cost me a few hundred dollars if not more but I decided to offer him some of my services in exchange. He’s such a busy guy that he needed to get his taxes done so I offered to do his return for him. Easy, peasy. The savings there alone are huge. What would have taken him a few hours to do his income tax return created more time for him to do side-jobs and make extra cash. Not only that but he said once I start the bathrooms he’ll gladly come over and do the plumbing for us. I guess I know who’s income tax return I’ll be doing yearly. Haha! If you know you have a service or talent that you can provide to others budget negotiations may result in savings like it did for us otherwise we would have had to pay out-of-pocket big bucks. Budget negotiations are not strictly meant for customers looking to grab a bargain as a preferred customer it’s about compromise. I don’t know how many times I’ve heard budget users tell me how their spouse told them what to do and they had no input into their monthly budget. Don’t be a budget hog and let your spouse in on the budget negotiations. My wife and I talked about putting me on an allowance since I’m the only one working which actually works out best for our budget. Without the allowance it’s so easy to just freely spend money especially when you are debt free and know you have money in the bank. This month the wife and I negotiated on a huge budget buster for many people, travel. We had a conversation over tea about how much money we would spend on our 2016 vacation and where we planned to go. Just because we budget for travel every month it can get enticing to pick out destinations that are over budget. Together we agreed on a vacation spot that our family would enjoy which ended up costing us less than what we have budgeted over the years as projected expenses and not used. Instead of making excuses as to why we needed to spend more jut because we had the cash saved we set limits and worked with-in them. How to get started with budget negotiations. You should start by pulling out the important fixed budget categories which means there isn’t much you can change unless you cancel the service. For most people this is not possible. 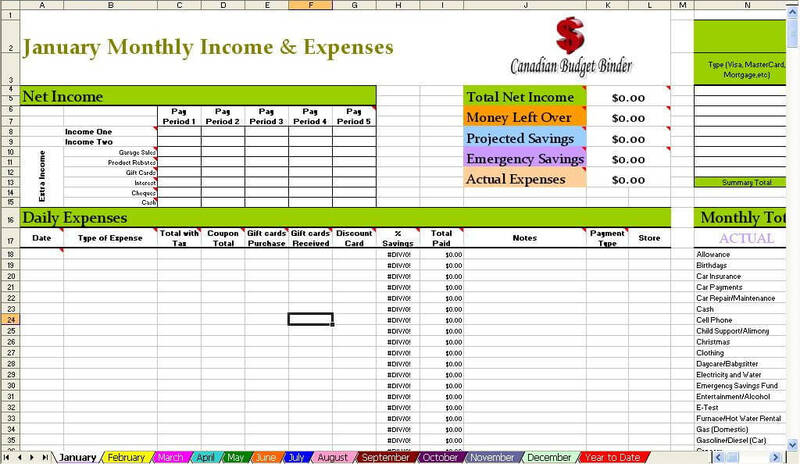 Create a checklist so you know what types of budget negotiations you will be working on. This may be your cable, home phone, cell phone, mechanic, repair guy, renovations and so on. Ask yourself what you are willing to pay and how what you plan to say when you start your budget negotiations. You don’t have to make up a story about why you’d like a deal or to get something cheaper, tell the truth. What are you wiling to give up if you can’t get a lower price? What are you willing to offer to complete the transaction? example: If you’re an accountant and he’s a mechanic offer your services to each other at a reduced rate or for free to save each other money. By negotiating with companies and among ourselves we can lower our budget and keep money in our savings account working for us. This my friends is how we become richer than we think we can become. Try it!! 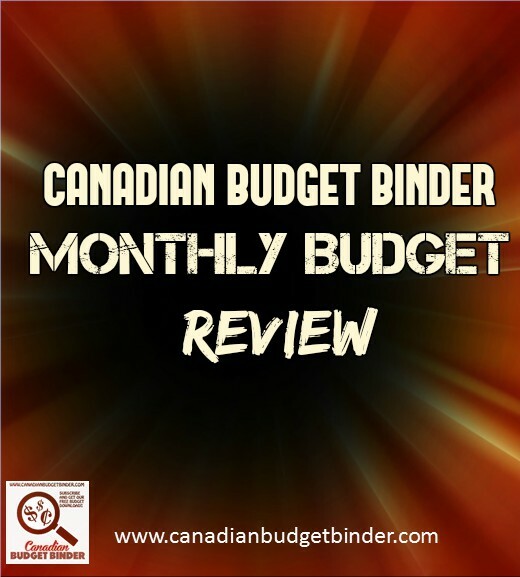 What budget negotiations have you made to lower your monthly expenses? 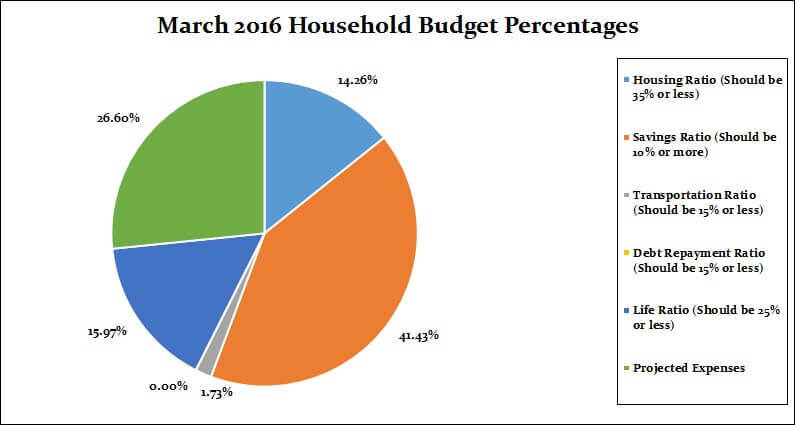 This month nothing too exciting happened with our budget as you can see apart from a few home maintenance expenses. These are the months where we are able to save even more because there isn’t quite anything going on around the house as the Spring tries to make its way into the world. I suspect the upcoming months I’ll be faced with more budget negotiations as I continue to hire people to help get stuff done around the house. Our savings of 41.43% includes savings and investments and emergency savings for this month. 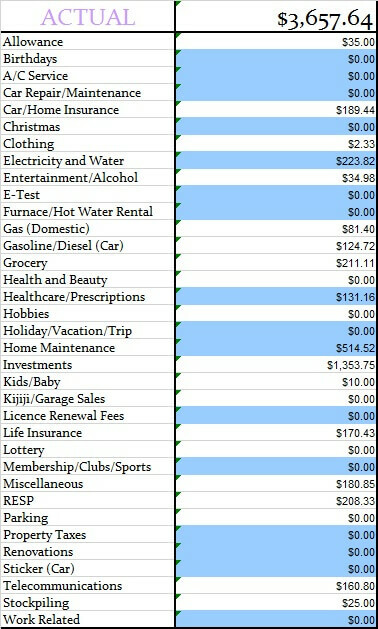 If you include the projected expenses savings, we actually saved 68.03% of our income. That’s $4903.59 going into savings or investments of some description or another. The other categories were well within the defined percentage limits. 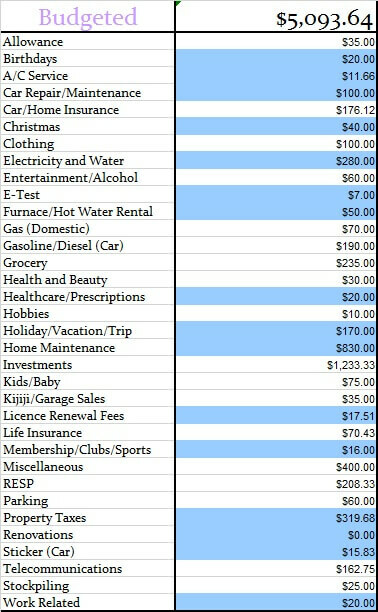 Our projected expenses this month is at 26.60%. Time for the juicy category numbers and to see how we made out with our monthly budget. Below you will see two tables, one is our monthly budget and the other is our actual budget for the month of February 2016. This budget represents 2 adults and a toddler plus our investments. Here are my April goals along with whether I completed tasks from March 2016. April is going to be a busy month for us as you can see and I’m sure I’ve only just scratched the surface. Swapping over seasons always requires lots of effort especially after winter. 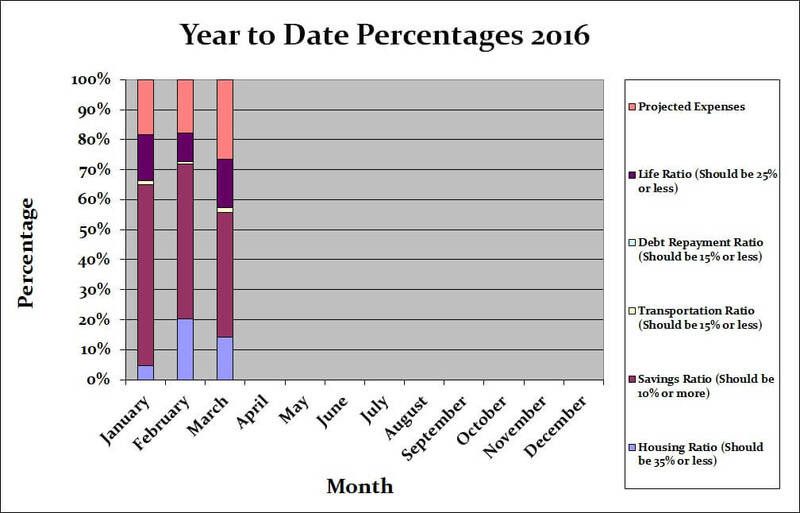 I will start the list off with our end of year budget update from 2015 just in case you missed it.